We listen to what you want the coverings to do and make the LOOK you LIKE work. Our product line ranges from the most current innovations, to the simplest and most practical. Our experts with DECADES of experiences will measure and fit your coverings in a truly professional manner. Most product knowledge is presented to the retailer by the manufacturers and they pass it onto you, the consumer. This information usually is incomplete as the manufacturers don’t focus on any imperfections in their product. We utilize the decades of hands on experience installing, handling, and repairing these products to present you with a more complete and impartial understanding of the products available. As an independent dealer we don’t have to sell the products that Head Office has told us to. We provide products that have proven themselves to our experts. 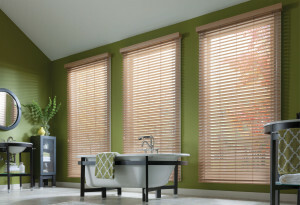 At Budget Blind Service you will get what works best for you today and for many years to come. The sales person you are dealing with should have at least 3 years experience in the business. Even if you are purchasing from a long established company make sure the individual you are dealing with is experienced. If they have a hard time with the learning curve they will not usually last past three years. Don’t just accept a sales person’s information at face value. Ask them where they learned it, because much of that information comes directly from the manufacturer and should be taken with respect but caution. If the sales person really knows what they are talking about they should be able to tell you personal experiences they have had with the product. There are manufacturers that have more quality products than others, but don’t expect the product to be the best simply because of brand name. Even the most respected brand names have products with flaws. This is where the knowledge and honesty of your sales person comes into play. BE AWARE of anyone claiming that their product is “AS GOOD AS” a well known and respected manufacturer. They should be able to explain what makes the brand name product so good and prove why their product is “AS GOOD”. TO GET THE BEST PRICE get three quotes and LET THE PEOPLE QUOTING KNOW that you are doing so. You will find that some retailers will ask you who you are getting the quotes from so that they know how sharp their pencil has to be. Know what products you want and don’t let them substitute a different brand or model. OUR PHILOSOPHY is to sell QUALITY products at GOOD prices. OUR GOAL is for you to be happy with how great they look today and impressed with how well they last down the road.